Is convenience and longer iPad battery life worth 99 cents? At work and at home, when it comes time to entering a lot of text into our iPads, we turn to our Bluetooth keyboards. The keyboards sit on our desks and on the kitchen counter. They are small enough to carry with us into meetings or be pushed out of the way when we need more counter room. The iPad and keyboard do a nice handshake on their own after the first time you tell the two to play together. When you carry the iPad far enough away from the keyboard the the Bluetooth wireless signal can’t reach they disconnect without any need for you to do anything. When the get close enough, they join together again. The downside to that automation of the two joining in the background is that both system’s Bluetooth is always keeping an eye out for each other as well as other Bluetooth devices to join up with. To save on the battery when moving around a lot, simply go to the ‘Settings’ icon on the iPad’s launcher, choose General, choose Bluetooth and slide the switch to ‘off’. When your at the keyboard again, repeat the steps to turn the Bluetooth back on. 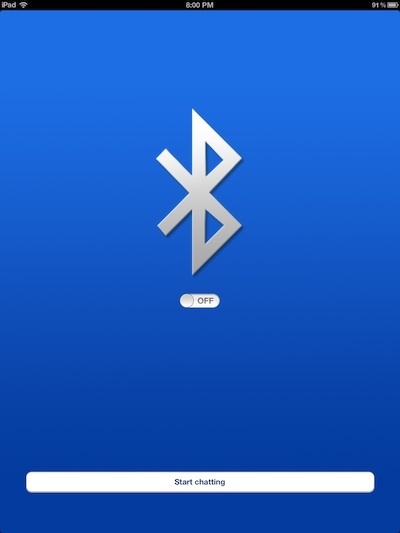 Or, you can grab a new little 99 cent universal app called Bluetooth OnOff. The app is best to be moved to a screen you can access quickly. The app is built to, as it’s name says, turn on/off your iPad’s Bluetooth. Tap the icon, slide the switch and the Bluetooth is turned on or off. That is three taps saved. If you want to cut the on/off process down to one tap, set Bluetooth OnOff. to do it’s action on launch. This way, when you tap the app’s icon, it will flip the Bluetooth to the opposite. Remember, you can always see if your iPad’s Bluetooth is on/off via the little icon in the upper right corner of the screen. To set Bluetooth OnOff. to do the change via one tap. Launch the iPad’s ‘Settings’ app, scroll down to the app OnOff, select it and slide the switch to ‘On’. That’s it. It is nice that Bluetooth OnOff. is Universal so we can install it on our iPhone’s too. There is even a bigger impact for the iPhone since there is no need to have the Bluetooth on when not around the handsfree speaker phone. One icon tap on/off is much easier. As a bonus, though we have yet to try it, you can chat with other iPad/iPhone devices via the app’s Chat feature… the big button at the bottom of screen.